At Surfland we have lots of gear you can't find at Wal Mart. We even have some stuff you can't get online! A lot of our plugs come from small, custom-produced companies, like Striper Sniper, and West End Tackle. 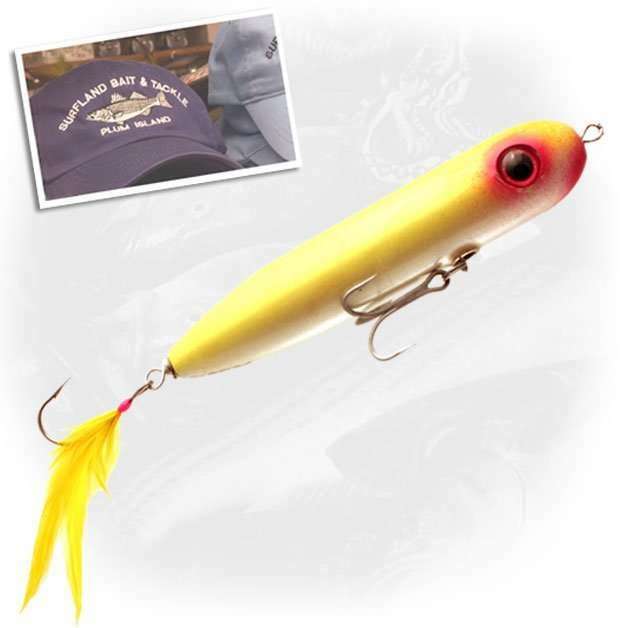 We've got custom cod jigs in the hefty 2 pound size. We've got custom hook streamers from Billy. How about a foot long custom-poured and rigged rubber bait by Mike? And best of all, our gang knows what's working and what's not, and aren't afraid to tell you. You'll also want to grab our custom shirts, hats, and sweats. When you've got a Surfland sticker on your car or truck, fishermen know you're in the club.